Architect Margot Krasojevic sells seashells by the seashore—not as souvenirs but as a stupefying hydroelectric home concept that’s making waves worldwide. 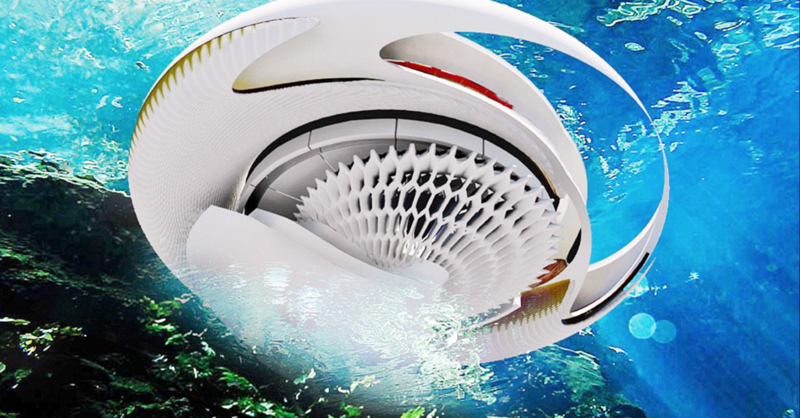 The London-based futurist’s seashell-shaped Hydroelectric Tidal House is designed to harness the tremendous power of ocean waves to generate all the kinetic energy a home would ever need. 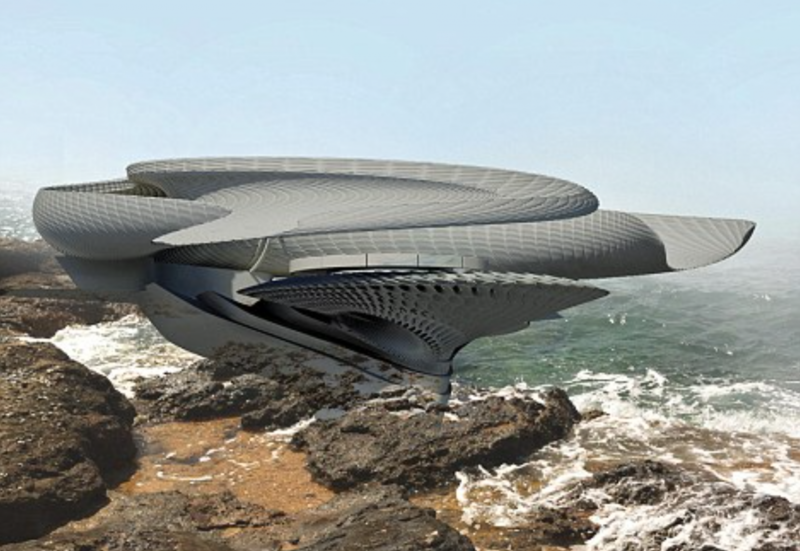 Architect Margot Krasojevic’s seashell-inspired home harnesses the ocean’s tides for energy. Unlike solar and wind, tides are predictable—therefore the tidal home’s energy source could be more reliable. As long as the Moon works its gravitational magic, this home’s lights will be on. And while storms infamously knock out power in traditional homes, storm intensity will create energy to spare for this tidal residence. If actually built, the tidal home would be constructed of two (hopefully extremely waterproof) sections—an inner and outer shell working cohesively much like a brain and skull operate. 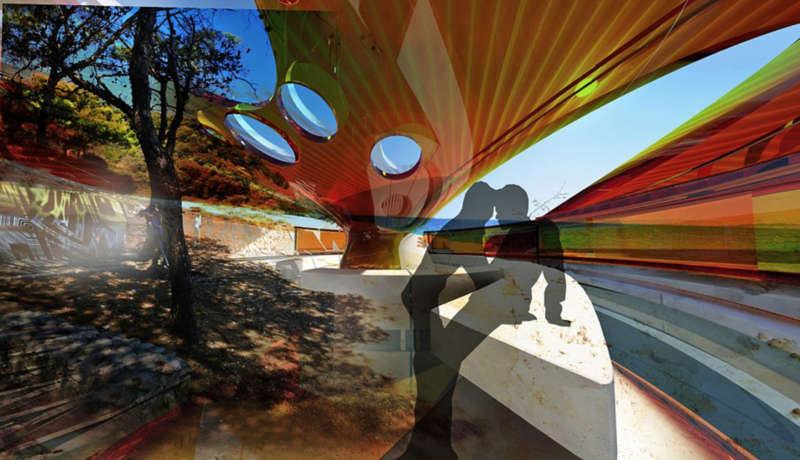 As the foundation, the concrete outer shell (the skull) stabilizes the house, utilizing solar cells to transfer energy to the living area (like the brain sending electrical signals through nerves to the body). The aluminum inner shell floats freely inside as the tide flows through it. 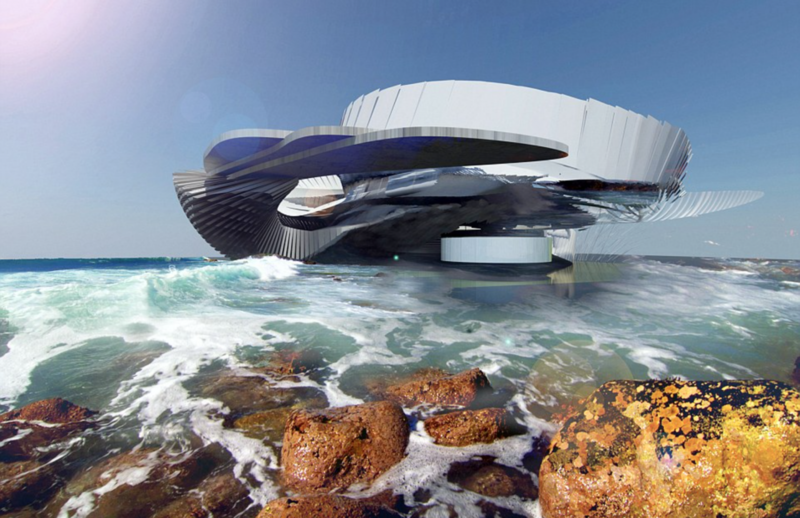 The Hydroelectric Tidal House is designed to harness the tremendous power of ocean waves to generate all the kinetic energy a home would ever need. Living space in the hydroelectric environment. Turbines react to the consistent power of waves, which compresses air and generates electrical currents through the home. Another part of the turbine generates electrical energy via magnets that transfer along a copper wire. No need to plug into the power grid, this home is self-sufficient—even if in concept stage. Best yet: no electric bills or meter readers swimming around your property. What resembles a lightning whelk seashell (scientific name Busycon perversum) on top could be mistaken for a modern stingray sea vehicle from underneath. 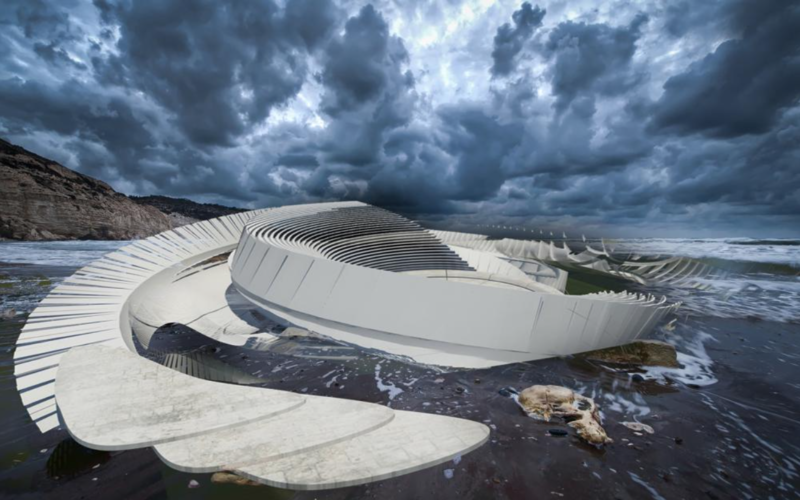 The Hydroelectric Tidal House appears to be inspired by both marine life. But the porous, twisting, water slide-like design is mostly functional and futuristic. The Hydroelectric home’s predictable tidal energy source is more reliable than solar and wind turbines. The Hydroelectric House on the shoreline. 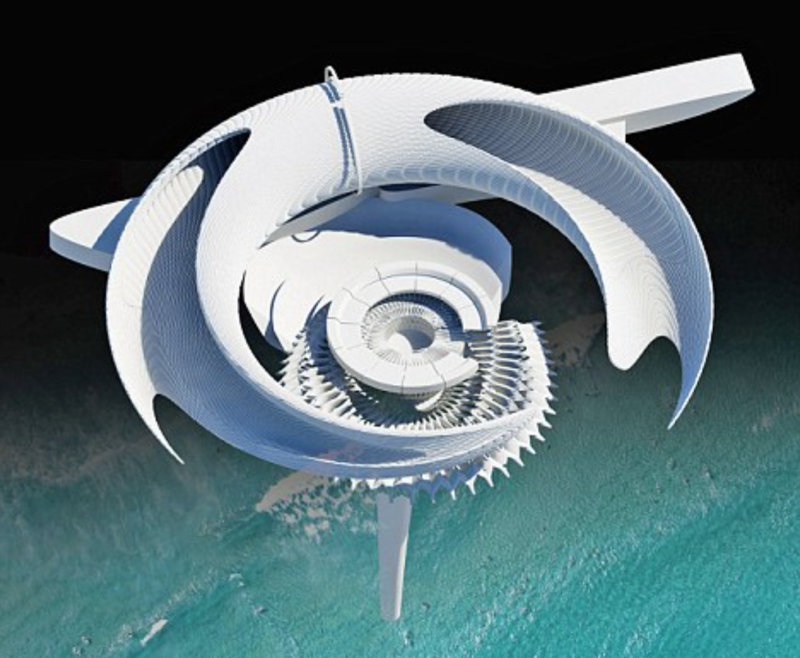 What looks like a space station here is a rendering of the porous twisting design and turbines, which react to waves. Krasojevic enthusiastic renewable energy concepts include the Hydroelectric House (above), an electric coral reef station, and a waterfall prison. Krasojevic also recently unveiled a futuristic champagne bar concept: an ultra modern structure called Grand Cru du Siecle, intended for the banks of the Seine in Paris. The enclosed circular glass bar features a monocoque shell (boasting natural light and etched glass) that’s designed to be placed over a “bell mouth spillway that swallows water and sends it into underground canals,” where it is then diverted into outlying lakes and reservoirs, reports London’s Dailymail.com. Krasojevic is an enthusiastic supporter of renewable energy. She is renowned for her hydroelectric concepts (an electric coral reef station, a waterfall prison) and other energy-efficient designs, which include an Aurora Borealis observatory, an arctic research center, a floating art gallery, and an airport runway layover lounge). 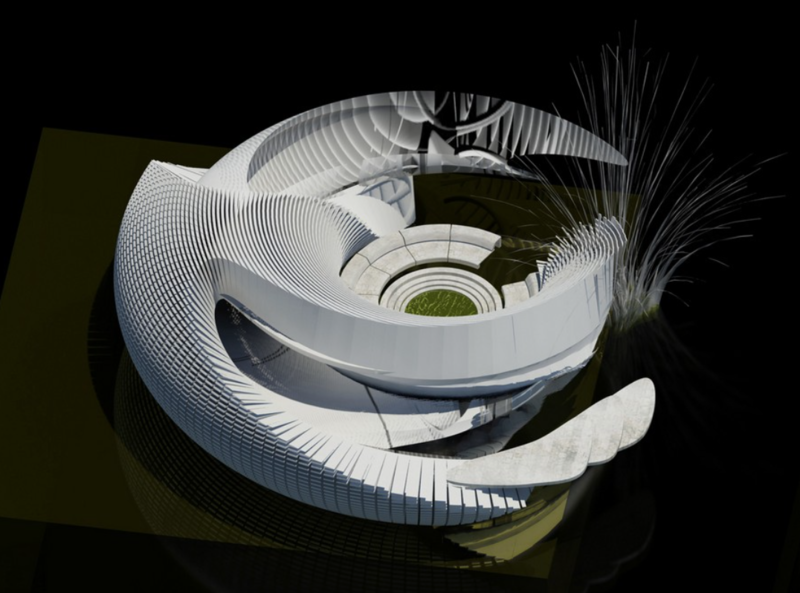 Krasojevic futuristic Parisian champagne bar concept called Grand Cru du Siecle. If you see one of Margot Krasojevic’s seashells by the seashore, don’t pick it up. You might cut off the power to someone’s seaside home.